Leverage the Acumatica solution to deliver even greater value to those you serve by offering new ways for them to access information and perform key activities anytime. Acumatica Portals enable you to create a customer portal experience where customers can access their information including contracts, financial statements, support cases, and more. The Acumatica Customer Portal helps you communicate with customers and work more efficiently. The portals work with your Acumatica applications, such as CRM and Sales Order Management, to provide helpful tools to allow your customers to see all the relevant information about their interaction and perform account-related activities online. You can also reduce customer support questions by providing anytime access to your knowledge base and document sharing. Customers can access account information 24 hours a day, 7 days a week, without picking up the phone or sending an email. Provide a secure location to share marketing material, educational material, company policies and FAQs with customers. Give customers the ability to see all historical documents, balances, due dates, payments received and amount due. Customers can also update address, contact and user access details. Business partners and resellers can view inventory and place orders themselves—speeding up the ordering process and freeing your sales team to focus on other activities. Maximize the profitability of each customer relationship. Provide faster, more attentive customer service. Give your whole team the tools to get more done in less time. Find out how to do this and more in a free webinar presented by Acumatica. By using Self-Service Portal, your customers can access their account information, create and manage support cases, and create and track online orders—all without picking up the phone or sending an email. All of these services are available 24 hours a day, 7 days a week. Customers can view and promptly update their company address and contact information, to keep the data in the system up to date at all times. Customers have the ability to see all historical documents, balances, due dates, payments received, and amount due. 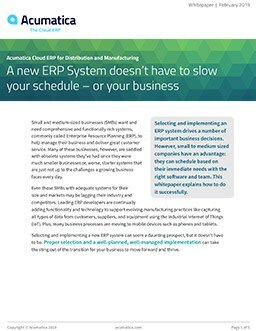 Submit new cases, which seamlessly flow into Acumatica ERP. The customers can view the cases they submitted, track the statuses of these cases, provide additional information when required, and reopen closed cases. With Acumatica Distribution Management applications, your business partners can use the Self-Service Portal to browse inventory and place orders on-line 24 hours a day, 7 days a week. The customer tracks the status of the order, shipments and view the invoice. With online ordering in Acumatica Self-Service Portal, you give your customers access to the products you sell with their descriptions and images. You control which products are visible to each user and which warehouses goods can be shipped from. Inventory and pricing is always up to date because it is connected to the same database as your Acumatica Distribution Management applications. Self-Service Portal provides a secure location to share important content with customers, such as marketing and technical documents — all without the need to build a separate webpage. The Knowledge Base (KB) wiki is designed to host support references, such as information on specific solutions, frequently asked questions (FAQ), and common troubleshooting issues and their resolutions. The KB articles, created and published by your company’s support professionals, ensure that your customers can search the knowledge base to find answers to their questions whenever they want.